It’s an unspoken goal of all companies: attract the best workers you can and then keep them happy. In many companies, that job -- and everything related to it -- falls to HR. In its 2016 Global Human Capital Trends report, Deloitte asserts that HR needs to move toward more “human-centered design” if it wants to improve employee productivity, engagement, and satisfaction within HR services. It makes sense. Today’s professionals live and work in an increasingly digital world and demand instant access to information via multiple channels. HR tools that cater to this reality improve employee productivity (good for business) and satisfaction (good for people and business). But too often these tools are applied to only one or two functions, such as payroll and benefits. 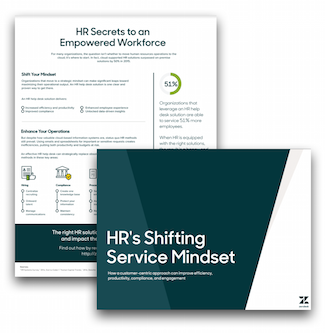 A new report, “HR’s Shifting Service Mindset,” explains how implementing an HR Help Desk solution as a supplement to other HR operations significantly increases employee engagement and satisfaction-- putting it front and center when it comes to business tools that effect real change.